It’s been a busy few week for me work-wise (hence the slow rate of blog posts), and that work has also taken me around the country a lot. A couple of weeks ago, I found myself in Auckland for a couple of days (teaching a cycle/intersection design course no less…) and I took the opportunity to have a look at a couple of recent additions to their cycle network, which we have featured previously. 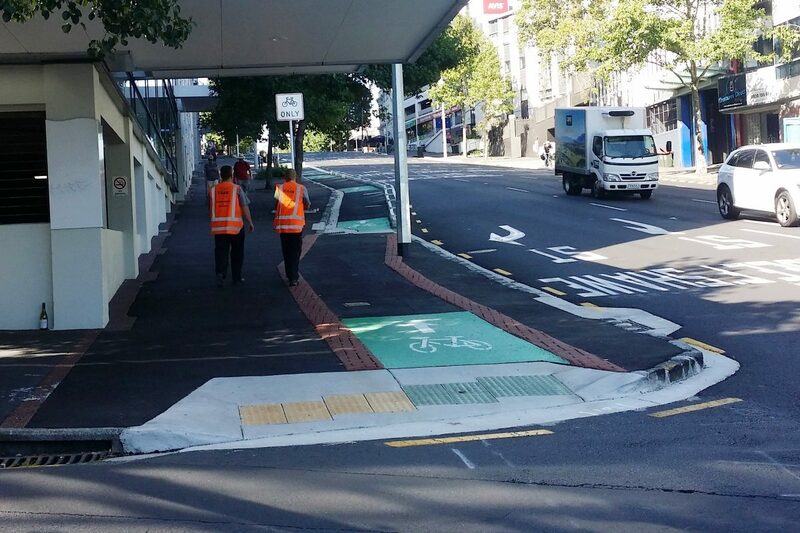 Auckland has been trialling these slightly raised brown textured edges, to help provide delineation for vision-impaired footpath users. Not totally sold on the aesthetics of them (let alone the functionality; almost a trip hazard), and Auckland is looking to trial some other treatments for these. As you can see, the pedestrians aren’t paying huge notice of the separation (and were walking on the cycleway a little further along). Have you seen any of the new cycleways in Auckland? 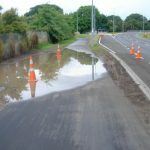 Thanks for the interesting update regarding the Auckland cycleways. Is this only a temporary (and particularly NZ) phenomenon, an sort of indicator for a period of transition to more sustainable forms of urban transport, which is particular hard for people who are used to car-dominated urban landscapes (and related privileges) that they have problems to cope with change and to adapt? I don’t think it’s a NZ-specific problem; I’ve heard about ‘bikelash’ in other traditionally auto-centric places too (even places like the Netherlands had their grumblers when the first extensive traffic restrictions were introduced). The best defense is simply more people using the new facilities (as seen in our latest counts), and loudly supporting them back – have your say in the current Council Long Term Plan consultation! Unfortunately after a short burst of heavy rain on Friday, the location of the where the photograph was taken had raw sewage running down the cycleway! Yuk. There was no way to avoid it as going up hill is against the flow of traffic so diverting on to the road isn’t an option. Next Next post: Yes, there are people who cycle in Christchurch – plenty!